Order two or more packs by April 22nd and save 20% — that’s just $63.96 per pack. On the phone or in person, listening is the single most important service skill. And while people assume they know how to listen, the truth is that listening is a technique, which most people will practice and refine throughout their careers. Now you can give your team the skills they need to become effective listeners with this five part training tool. 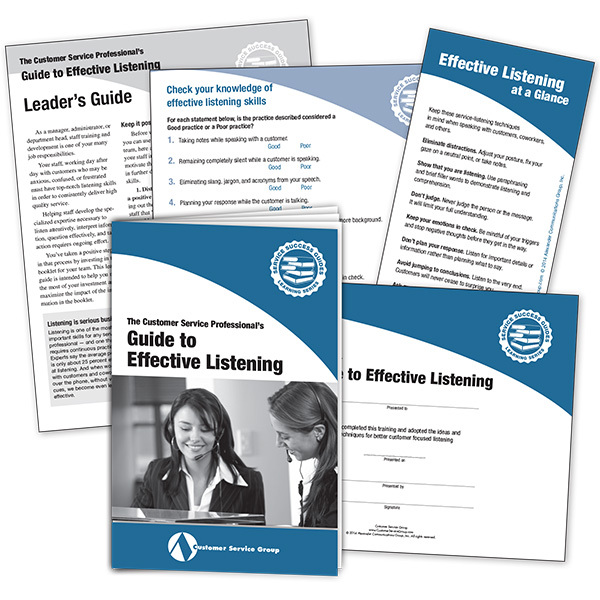 The guide begins with the nine techniques needed for “service listening.” While many of these techniques come naturally, the key to becoming a better listener is to identify, understand, and practice them. The second section covers the special issues encountered when dealing with challenging customers, those with foreign accents or communication difficulties. There’s even a self quiz, which will help your frontline staff evaluate their current skills and pinpoint areas for improvement. There’s a big difference between hearing and listening. With the exception of those with hearing impairments, all of us can hear — it’s just sound waves pounding on the eardrum. But to really listen you must actively take in what you hear, interpret it, and be able to act on it. Whether you are working with a customer, client, or coworker, on the phone or in person, that type of listening is the foundation of good customer service. The person who reaches out to you has an objective — a problem that needs to be solved or a question that needs to be answered. They may even have a secondary objective or an unspoken objective. It’s up to you to be able to interpret, question, respond, and take action. But if you aren’t really listening none of that will happen. One of the best ways to become a better listener is to practice service listening. This is where you make a conscious effort to not only hear what the speaker is saying but also to understand what the speaker is saying and how the speaker is feeling. Most people use many of the service listening techniques without even being fully aware of it — they just come naturally. The key to improving your skills is to consciously use these techniques in every customer interaction. They will quickly become second nature and you’ll find that you can give every customer your full attention in the most positive, professional, and productive way. But before we present the service listening techniques, take the brief self-quiz on page 3 to learn where you may need to focus extra attention in the future. One area of special attention should be the final section of the booklet, which reminds readers to know their options when working with a customer who is not fluent in English or has communication difficulties. All staff members should know who they can call on if they are having trouble communicating with a customer. A simple chart showing staff names, their extensions and specialties will go a long way in easing communication and avoiding frustration for both staff members and customers. It is the policy of many organizations to have a written language access plan. Key features of such a plan typically include a designated staff person, details on available language services, translation of certain documents, staff training, and more. Creating this type of plan and staff position can provide a challenging opportunity for an individual or team. Guide to Effective Listening is guaranteed. We want you and your reps to use this valuable resource and put its ideas to work in your department. Then, if you are not 100% satisfied, you may return your materials within 30 days for a full refund.